The North East Culture Partnership is preparing for the North East region’s second Stakeholder Forum. This will be held on 5th November at ARC in Stockton between 10:30 and 16:00. 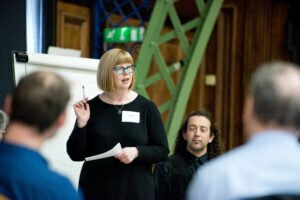 This year we are inviting proposals from cultural practitioners to lead parts of the discussion to help set the priorities for the sector for the coming years. An invitation has been circulated calling for contributions from as wide a range of arts and heritage practitioners as possible. If you are interested in contributing, click here to read more. The Forum will start with a reflection on the Case for Culture from a leading member of the cultural sector, to help stimulate partners and stakeholders to look for innovative and new ways for working to help us all meet the aspirations in the region’s cultural strategy. Later in the programme, there will also be a number of presentations about emerging policy; the Arts Council and the British Council have already agreed to participate. The event will be sponsored by the Tees Valley Combined Authority, reflecting the culture sector’s increasing importance in the wider regeneration and social agenda for the region. All in all, it will be an opportunity for the cultural sector to once again come together and help shape our collective priorities and activity for the next stage in the delivery of our regional strategy. The timetable, programme and schedule will follow but you can secure your ticket here. Read about last year’s Forum here.